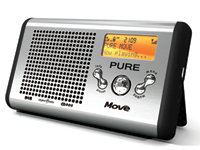 Pure Move is a stylish, palm-sized DAB digital and FM radio which ideal for listening on the go, introduced by Pure Digital, an UK’s leading portable radio manufacturer. Pure Move features include textSCAN for pausing and controlling DAB scrolling text, 20 presets, integrated FM reception, an auxiliary input for connecting an iPod or MiniDisc player and a mini USB connection for future product upgrades. Pure Move also allows users to plug the headphone output into a Hi-Fi system and use it as a DAB tuner. Pure Move also provides over 40 hours of great-sounding DAB digital radio wherever users go, with built-in ChargePAK battery pack recharges from the mains. vnunet (link dead) reviews Pure Digital Move digital radio and concludes with overall rating of 4 out of 5 stars that Pure Move has fantastic battery life, small and compact, good sound quality and volume for the size. However, it’s more expensive than a portable FM radio. Overall, the Pure Digital Move will undoubtedly find a welcome home with outdoor types.